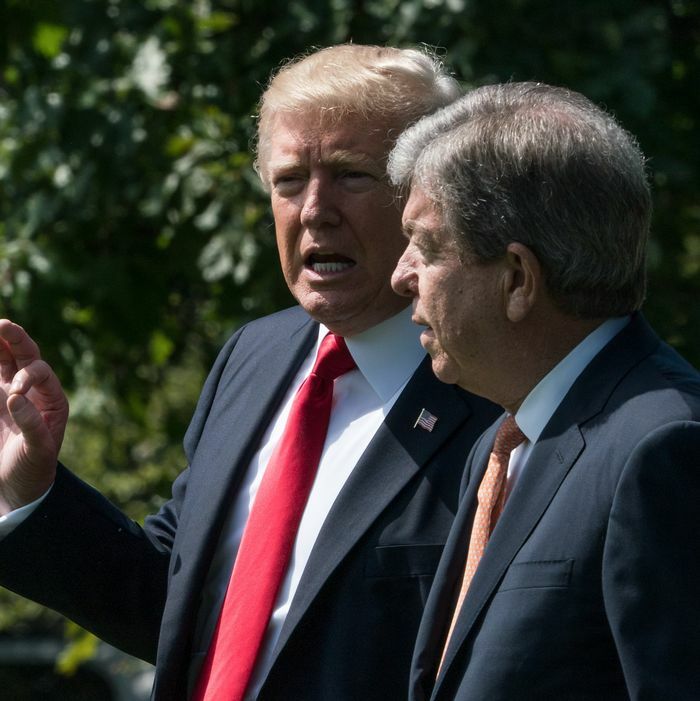 President Trump and Senator Roy Blunt head to Air Force One to talk tax reform and ending the Russia probe. Days after he fired FBI director James Comey, President Trump told NBC News that he did it because he was thinking about the probe into his campaign’s possible involvement in Russia’s election-meddling. “In fact, when I decided to just do it, I said to myself, I said, ‘You know, this Russia thing with Trump and Russia is a made-up story, it’s an excuse by the Democrats for having lost an election that they should have won,’” the president said. Obstruction of justice cases often come down to whether prosecutors can prove what a defendant’s mental state was when he or she committed the act, legal specialists said. It is not enough to show that a defendant knew the act would have a side consequence of impeding an investigation; achieving that obstruction has to have been the specific intention. But if special counsel Robert Mueller — who is reportedly looking into whether Trump obstructed justice — could establish that Trump made a habit of trying to shut down the Russia probe, they might be able to build a case. On Thursday night, the Times gave them some new information to consider, reporting that Trump repeatedly pressured several top Senate Republicans to wrap up their Russia investigation — including the chair of the Senate Intelligence Committee, which is conducting its own probe of Russia’s election interference. The conversation occurred over the summer, around the time Trump was publicly attacking Attorney General Jeff Sessions for recusing himself from the Justice Department’s Russia probe. Other Republicans with whom Burr discussed the conversation said he described Trump as “very forceful,” stressing repeatedly that it’s time to “move on” from the Russia issue. An anonymous GOP senator said Trump called several other lawmakers over the summer, urging them to push Burr to wind down the investigation. The conversations would start on another topic, but eventually wind up on Russia. Another senator said Trump hadn’t urged him to shut down the Russia inquiry, but he suggested the Justice Department should be probing Hillary Clinton’s ties to Fusion GPS, which put together the unverified dossier on the president’s Russia connections. White House principal deputy press secretary Raj Shah said there was nothing improper about the president calling top senators to badger them about their investigation. Trump “at no point has attempted to apply undue influence on committee members’’ and believes “there is no evidence of collusion and these investigations must come to a fair and appropriate completion,” Shah said. Burr and Blunt downplayed the significance of Trump’s behavior as well — though they were concerned enough to try to limit their interactions with the president. Burr said he didn’t feel pressured by Trump, and suggested he’s just ignorant of proper protocol because he’s “never been in government.” Burr said he saw no “sinister motive” in Trump’s call, and suggested he still wasn’t thinking like a politician, months after assuming the presidency. “Businessmen are paid to skip things that they think they can skip and get away with,” he said. Trump’s alleged confusion on whether it’s okay for the president to urge senators to stop investigating him did not end at members of the Senate Intelligence Committee. As previously reported, Trump frequently complained to Senate majority leader Mitch McConnell that McConnell wasn’t doing enough to protect Trump from the Russia investigations. Sources said Trump also told Senate Foreign Relations Committee chair Bob Corker that he was upset that GOP lawmakers weren’t helping him dispel the cloud of Russia-related suspicion. Outside the Senate, Trump reportedly called NSA director Mike Rogers and Director of National Intelligence Dan Coats and asked them to publicly deny that there was any collusion between his campaign and Russia, which they refused to do. In June, they dodged the Senate Intelligence Committee’s questions about whether Trump wanted them to sway the FBI’s probe, but they said they never felt he pressured them to do something improper.